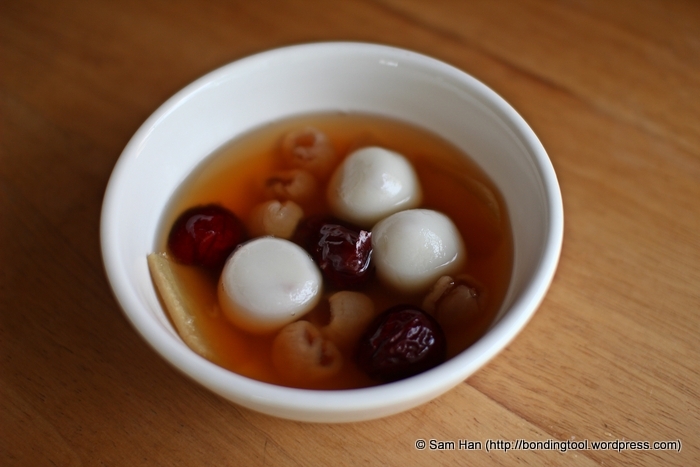 The northern Chinese folks call them Yuanxiao (usually eaten during Chap Goh Mei or the The Lantern Festival) and the southerners call them Tangyuan (eaten during the Chinese winter solstice). 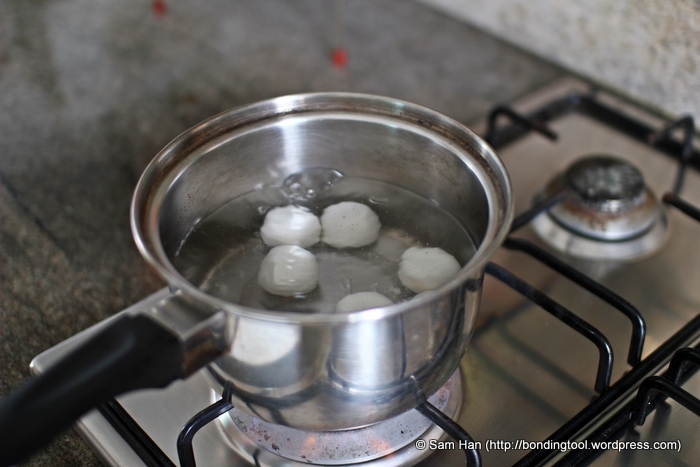 In Singapore, we call them Ah Boling (Ah Balling) but it is actually Ah Bo Nin. Ah Boling is supposedly a homophone in the Teochew dialect where “Ah Bo” is mother duck and “Nin” refers to the bopping up and down action of the mother duck’s head. 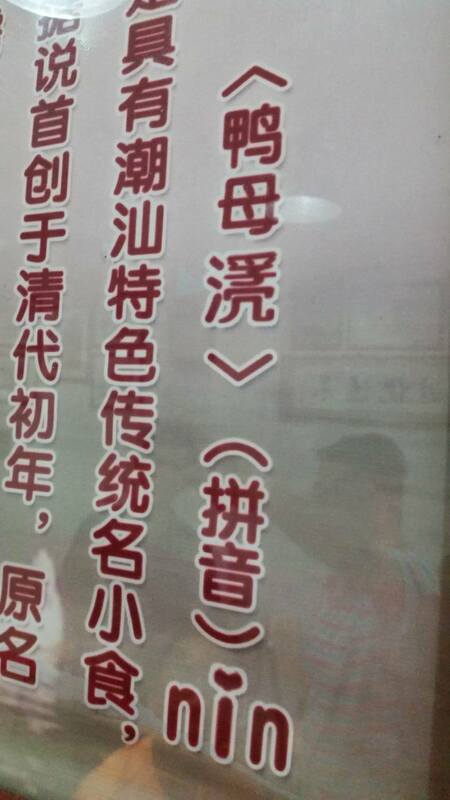 Photo courtesy of Johnny Ng where he took this menu on the wall of a dessert restaurant in Swatow, China. Ah Boling used to be simple – 5 balls of different fillings – red bean, black sesame, peanut, yam and in recent years, the durian paste. Unlike Yuanxiao which is a savoury vegetable soup based with minced meat filling in the rice balls – Ah Boling is much more like Tangyuan, the sweet sister of Yuanxiao. The original hawkers sold Ah Boling in sugared water, some slices of ginger and a huge bundle of pandan leaves. Later, sophisticated tastes produced sweetened soybean milk as the soup base. Variations like boiled peanuts or lotus nuts are added to the soup, too. It is not difficult to make plain glutinous rice balls from scratch but to make those with fillings, some pinching skill is required – otherwise the fillings may burst into the soup during boiling. Again the ingredients on this post dates back to the Shaoxing Chicken post when Keef and I shopped at Parkway. We bought a lot of stuff together with this packet of frozen Tangyuan. We decided to cook them with whatever was available in his fridge. Ah Boling is a delightful dessert. 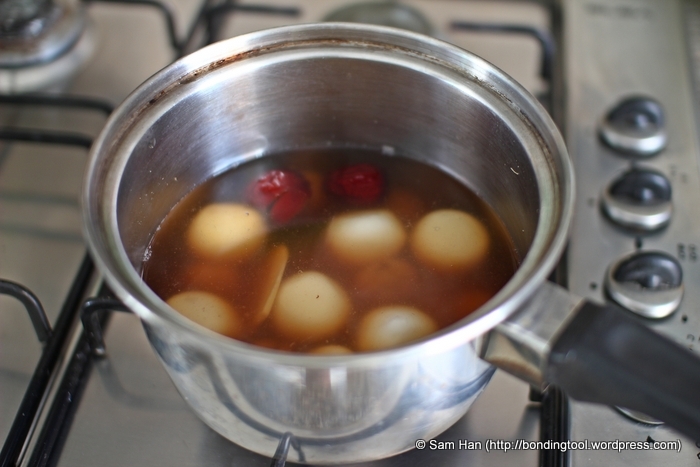 It doesn’t require much effort to make this hot dessert at home these days because one can easily buy Tangyuan of any desired fillings from the supermarket. In Melbourne, we usually buy Peanut, Black Sesame, Yam and Red Bean paste filled Tangyuan, all at the same time and uses a few of each paste to create a “surprise me” bowl of Ah Boling. Use as much ginger slices as you desire to create a mild or spicy hot soup. Here I used about two thumb length as I like mine really spicy to get rid of “wind” in my body. Keef had some dried longans and red dates so in they go. He suggested goji berries too but I think these are enough for today. We only used 6 (3 per person) out of 15 balls in the package and we’ll try the goji next time. Put all the ingredients in a small stockpot and fill them with enough water. Bring to the boil over medium heat. 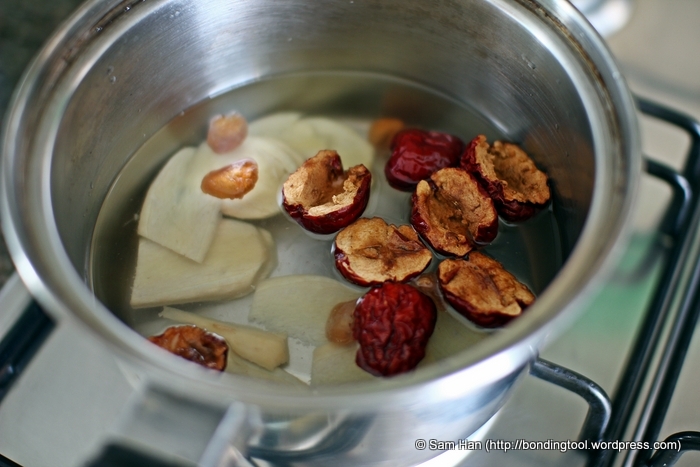 When the water starts to boil, reduce heat to medium low and simmer for at least 15 minutes or longer, if you like it spicier, until the soup taste gingery and the dried longans double in size. Add sugar to taste when the soup is ready. 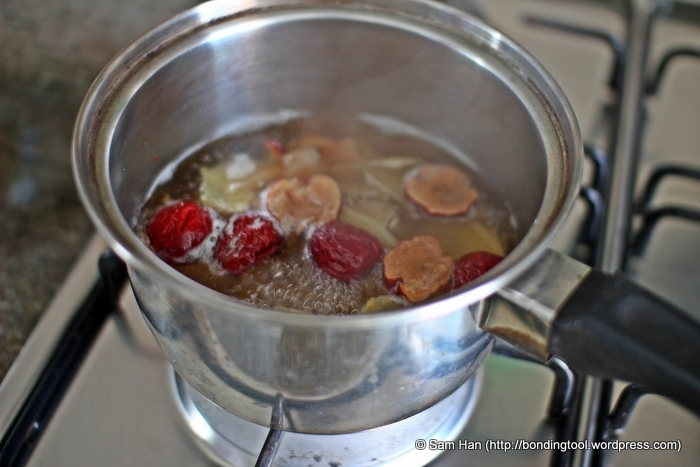 After this soup has simmered for 15-30 minutes, add in the Ah Boling or prepare the Ah Boling in a separate pot. I prepared ours in a separate pot to keep the balls looking “white” for photo taking for this post. On lazy days, I dump them straight into the pot. The soup might be a little more viscous if you do that. For clearer soup, boil separately. In another pot of boiling hot water, put in the number of glutinous rice balls you like to eat and boil them on medium high heat for 5 minutes, then lower heat and boil another 3 minutes (or follow the manufacturer’s instructions on the package). Keep stirring gently during the first few minutes to prevent the balls from sticking together. When the balls are floating, it means they are ready. Be careful not to burst the balls with fast boiling on ravaging high heat. Patience is key. If you do not mind about the fillings being broken during boiling, you can skip the above step of boiling the rice balls separately. Just cook them directly in the soup when the soup has reached the right gingery state of taste according to your desire. 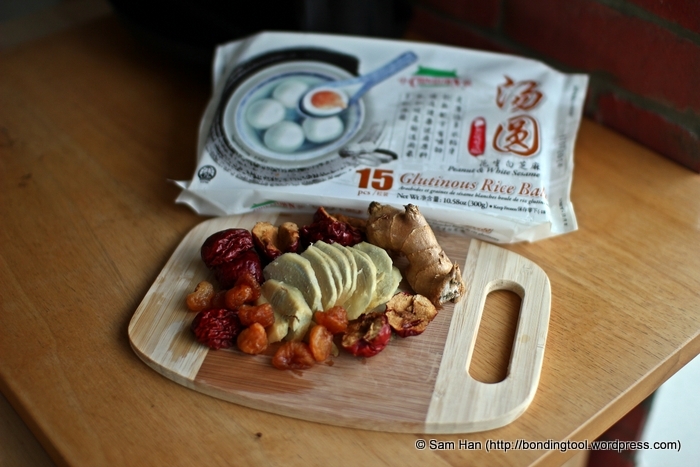 1 packet of Tangyuan with the filling (s) of your choice (use as many as you want). 4 Red Dates (remove seeds), rinsed. 1 slice-2 thumb-sized Old Ginger, peel skin, rinse and sliced thinly. 2-3 tablespoons Sugar, (or adjust to your taste). 600ml Water for soup base (250ml-300ml soup for each person – drink the ginger soup as they are good for blood circulation and “body warming” especially during winter time). more Water for boiling the rice balls separately, if using this extra step. A few Pandan Leaves, bundled. A few slices of Old Ginger. Put everything in a pot and simmer for 15 minutes or till the desired pandan fragrance and ginger spiciness is achieved. Heat all the ingredients except for the rice balls in a pot and bring it to a fast boil. Lower heat to medium low and simmer for at least 30 minutes. Place the rice balls in the soup or cook them separately in another pot. Drop in the rice balls gently and keep stirring to prevent the balls from sticking to each other over medium high heat for 5 minutes. Lower heat to medium and cook a further 3 minutes. When the balls are floating and soft to the touch, they are ready. Place the rice balls in a bowl and top with the ginger soup. Serve hot. 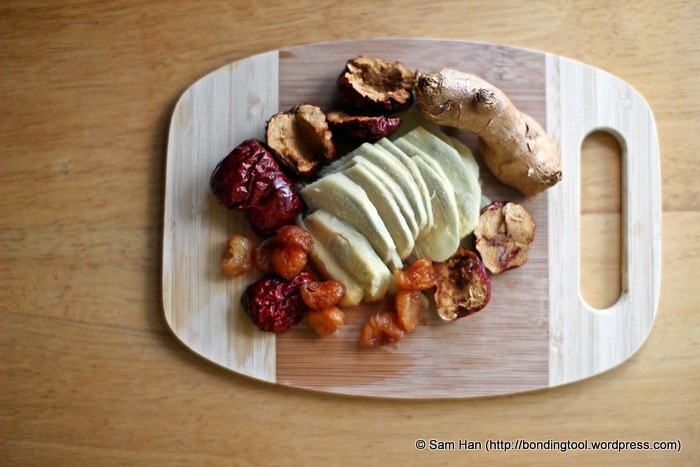 The ginger, red dates and dried longans may be eaten.